Proper, professional and just a little bit playful – meet the Jordan Loafer. 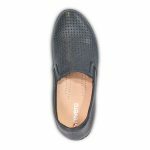 These ladies orthopedic shoes are a low profile loafer with a lot of personality. The twin gusset detail lends flexibility, and a tapered wedge make these fashionable shoes for orthotics. 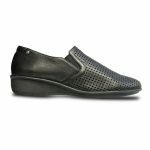 In typical Revere Shoes style, these shoes feature a removable insole for interchangeable orthotics.